For our second ZX Spectrum game, Andrew was tinkering with an excellent turbo loader called 47Loader Turbo Edition. 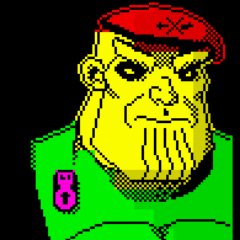 He was able to make it draw an excellent graphic while a game loads. This turned into a shooting game which I did the graphics for too (apart from the player space ship which was used free from elsewhere - I forget!). Andrew also managed to get Yerzmyey to provide us with some excellent game music (AY format). It is a very short-lived game and was mainly meant as a precursor to Spiker 2:Basic Training which is a more "complete" game for the storyline provided..